Record-low solar, wind and energy storage costs have caught the attention of mining companies looking for clean power. Until about eight months ago, rolling blackouts were a common occurrence in South Africa, where the national power grid is notorious for being unreliable and Eskom, the state-owned utility, has struggled to keep up with rising electricity demand. But Eskom can’t take credit for this period of relative stability. On the contrary, the situation is not about what Eskom did; it’s about how industry reacted. Electricity demand has eased in the country. Worries over patchy, unpredictable power supply have driven away investment and slowed economic activity. South Africa’s massive mining sector is among the most affected. “The recent power crisis in South Africa is a textbook example of the impact of unreliable power supply, curtailing output in employment-intensive industries such as mining and placing the country’s reputation at risk as an attractive investment destination,” according to the World Bank. The risks are not unique to South Africa. The World Bank estimates that two-thirds of people in sub-Saharan Africa live without electricity and those with it suffer constant disruption. For Johannesburg-based Gold Fields, the world’s seventh-largest gold producer, this power predicament was the nudge it needed to seriously consider the role that distributed renewable energy could play in its operations. In 2014 the company partnered with Carbon War Room (CWR), the Richard Branson-founded think-and-do tank – now part of the Rocky Mountain Institute – that helps industries look for profitable ways to reduce greenhouse gas emissions. Tessa Lee, a senior associate with CWR’s Sunshine for Mines program, said the non-profit began focusing its attention on the mining industry in 2012. That’s when it first heard about a South African chromium mine operated by Munich-based Cronimet Mining, which was using a 1-megawatt solar PV system to offset its use of diesel generators. Navigant Research estimates that the global mining industry consumes about 400 terawatt-hours of electricity per year – nearly as much as all of France – yet renewable energy (excluding large hydropower) only accounts for 0.1 per cent of total supply. Most of that supply consists of small pilot projects supported by government subsidies. 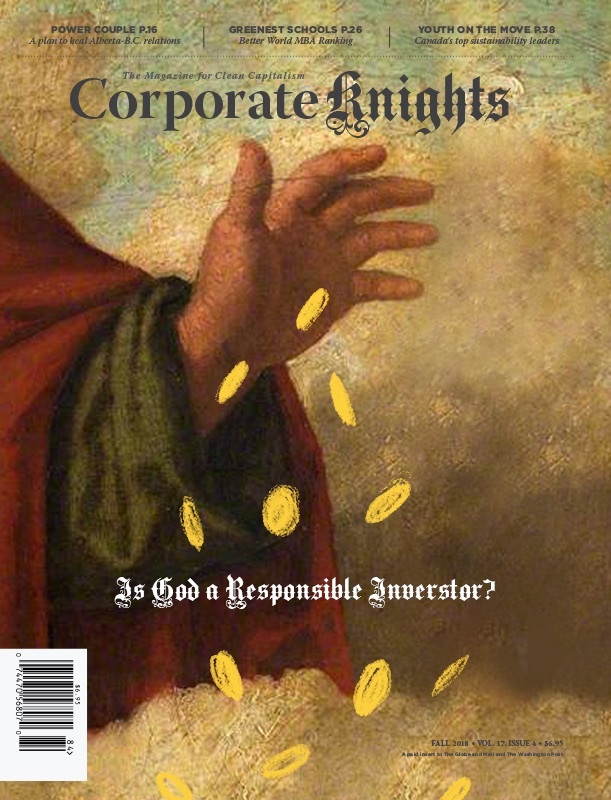 A deeper dive by CWR’s team revealed a number of market hurdles, including a perception in the industry that renewables are unproven, too expensive, and costly to finance. Many mines also have a shorter lifespan than a typical solar, wind or geothermal operation, which have longer paybacks than diesel generators. Lack of in-house expertise posed another problem. “We looked at what we could do to start overcoming those barriers,” Lee added. A key part of that process was the 2014 partnership with Gold Fields, which agreed to become a case study from which the mining industry could learn. CWR looked at the company’s entire global portfolio of mining sites, from Australia to Peru to South Africa. It analyzed how much Gold Fields was paying to purchase and transport diesel fuel in each region, and the level of price volatility and environmental risk the company faced. Was energy security itself at risk? Was grid power an available, viable and reliable alternative? Gold Fields’ South Deep gold mine in northeast South Africa stood out as a potential good fit for solar. Often called the continent’s “last great gold mine,” South Deep is one of the largest gold mines in the world, and while it began operation in 1961, its lifespan is expected to stretch to 2080. The mine processes about 300,000 tonnes of ore each month, and needs an average of 55 megawatts to operate. Currently, Eskom supplies that power mostly from its fleet of coal-fired power plants. The price of that dirty power is rising and reliability has been falling. To get a sense of how solar would compare, Gold Fields launched a procurement process for 40 megawatts of solar that resulted in an impressive 75 expressions of interest and 10 final proposals, many of which claimed the clean electricity from their projects could match Eskom’s electricity rates from their first day of operation. This assumed a 20-year-plus power purchase agreement would be in place. “We even learned that energy storage could also be installed on par with the cost of diesel generation, so that was big news for the industry,” said Lee. Gold Fields is now reviewing those bids and plans to select a developer this spring. If all goes well, construction will begin by year’s end. In the meantime, Gold Fields is looking to replicate the approach with its Salares Norte gold mine in the Atacama region of northern Chile. 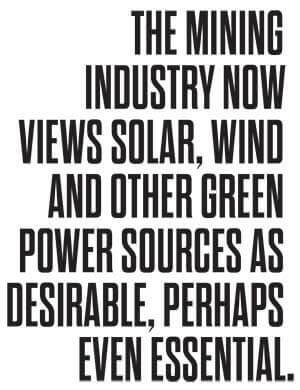 That view is consistent with the findings of Navigant, which in a 2013 report declared the “tipping point has now been reached.” The mining industry doesn’t just see the integration of renewables as doable; it now views solar, wind and other green power sources as desirable, perhaps even essential. Navigant forecasts renewables (again, excluding large hydro) will represent between 5 and 8 per cent of global mining industry power consumption within the next six years, with investment in green power projects expected to increase five-fold to more than $6 billion (U.S.) between 2015 and 2022. CWR is pushing for renewables to represent 15 per cent of industry power consumption by 2025. Africa is one hotbed, along with South America, where countries such as Argentina and Chile have been pushing to get more renewables on the grid. Argentina is aiming for 20 per cent by 2020, up from 3 per cent today, while Chile is targeting the same for 2025, up from 8 per cent. That will lower the carbon footprint of grid-connected mining operations. But for those companies in remote areas where grid access is non-existent and using diesel is expensive and environmentally risky, renewables have become a default consideration. Consider that mines in Latin America invested just $37 million (U.S.) in renewable energy projects in 2013. Ernst & Young expects that figure will rise dramatically to more than $1 billion by 2022. “For new projects it’s definitely not an afterthought anymore,” said Scott Fraser, an independent energy consultant in Toronto and former director of power projects for Barrick Gold. A large number of the world’s mining companies are Canadian, so it’s a trend that Bay Street is closely following, he said. For mines operating within Canada, the story is playing out a bit differently. Unlike Africa and South America, solar is a less popular option given the northern latitude of many Canadian mines and the lack of wintertime daylight. In these regions, wind has proven a more popular choice where grid access is not available, Fraser said. One of the highest-profile examples is Rio Tinto’s Diavik diamond mine in the Northwest Territories, about 300 kilometres northeast of Yellowknife. Four wind turbines were erected in 2013 to reduce the use of diesel fuel, which had to be trucked in on a 550-km ice road at a cost of $70 million a year. Today, the wind reduces diesel demand by 10 per cent and is saving the mine about $5 million a year. The project is expected to pay for itself in six years. A government-assisted pilot project at Glencore’s Raglan Mine, located at the northern tip of Quebec, offers a peek at how remote mining operations might evolve across Canada. In mid-2014 the company teamed up with Tugliq Energy and engineering firm Hatch to install a 3-megawatt wind turbine for offsetting diesel use at the nickel mine. It’s not unlike the Diavik mine, except for one twist. This year, a flywheel, lithium-ion battery system and hydrogen station will be added to create a remote smart microgrid that could one day completely eliminate the need for diesel fuel at the site. 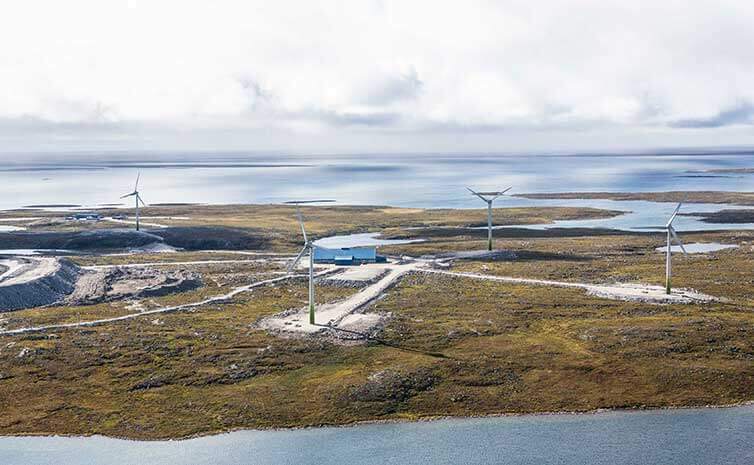 Michel Carreau, director of energy at Hatch, said Tugliq Energy intends to build similar wind-storage systems at other mines and remote communities across Canada. Avalon is looking to mine lithium minerals used in lithium-ion batteries at a site located near Kenora, Ontario. Bubar said he’s committed to powering the project with a possible combination of hydro, wind and solar, and is also considering energy storage. “We are scoping out all the possibilities now,” he said. Barriers still remain. What happens, for example, when the life of a mine is shorter than the life and payback of the renewable energy and storage equipment being installed? Who’s going to buy all of that power when the mine closes? And if no buyer is obvious, who will carry the risk if a project goes forward?